Suddenly I remembered kabos! The colors, the grill, the outside cookin', the fun of spearing and de-spearing! Somehow, I had forgotten about kabobs, but I knew this was my chance. pre-grilling, so bright and beautiful! I did actually use a recipe for the barbecue sauce, an old recipe from that old Blossoming Lotus cookbook called Vegan World Fusion. Most of the sauce gets soaked up in the veggies and tempeh, but there's about a half-cup left over for dipping and pouring over all the goodies post-grilling. 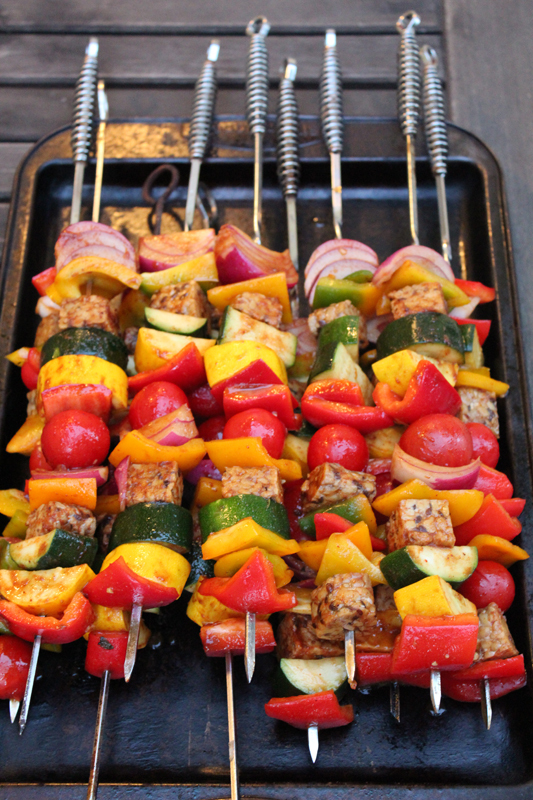 I am not usually a two-pictures-of-the-same-thing kind of blogger, but by the time I was done grilling all these kabobs, it was too dark to get a pretty post-grill picture. Even though there are just two of us, I (obviously) made a TON, because then I had a whole bunch leftover for lunch the next day. possibly my weirdest doodle EVER??? I had so much fun making these, I'd love some ideas for other things to poke with spears! What are your kabob favorites? Recently I saw some brussels sprouts kabobs online and now I desperately want to try that - so for now, that's the next kabob experience on my list! 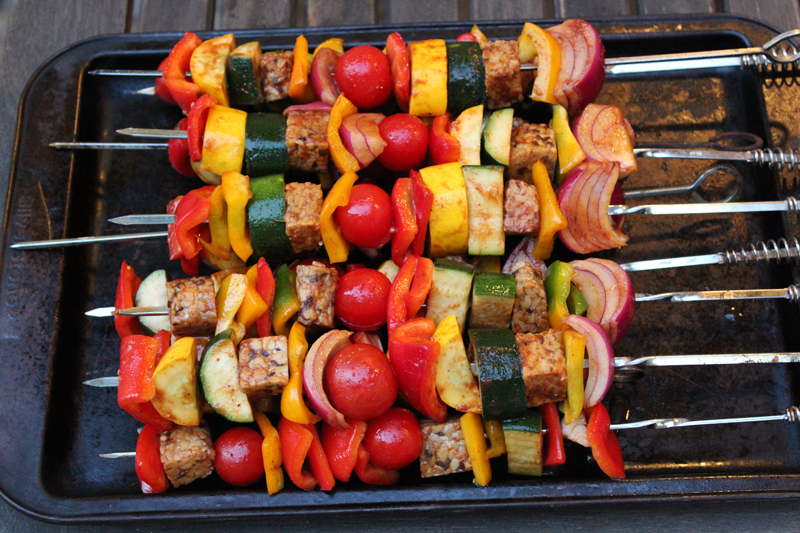 Love them kabobs! We had 'em just last week -- SO easy and tasty. I did a quickie version very much like yours, plus mushrooms. A brief toss in the basic marinade -- soy sauce, oil, garlic, ginger, S&P -- then popped under the broiler and served with my standard pilaf. Big hit! Those look wonderful! Such a great summer idea! Mushrooms are my kabob favorite for sure, bbq umami! I love all the different things you can put on a stick, especially with peanut sauce. You should made custom family kebob doodles! :) So cute! I always add mushroom and pineapple to mine, I love grilled pineapple! I'll have to try with tempeh!